On this date in 1801, robber prince Franz Troglauer was hanged at Amberg. A lifelong picaro, Troglauer had several brushes with the law at his back when around 1790 he formed up the Fürth Diebesbande, or Great Franconian Robbers’ Band. The gang was betrayed and broken up in 1798. Troglauer managed to escape and briefly resume his career, but his overt threats to assassinate a prominent landlord who had been involved in his previous prosecutions helped to intensify the search that brought him once more to prison and at last to the gallows. * This is a network rather than a hierarchy; Jakob Meusel was another important leader, and it’s sometimes also called the Meusel Band after him. 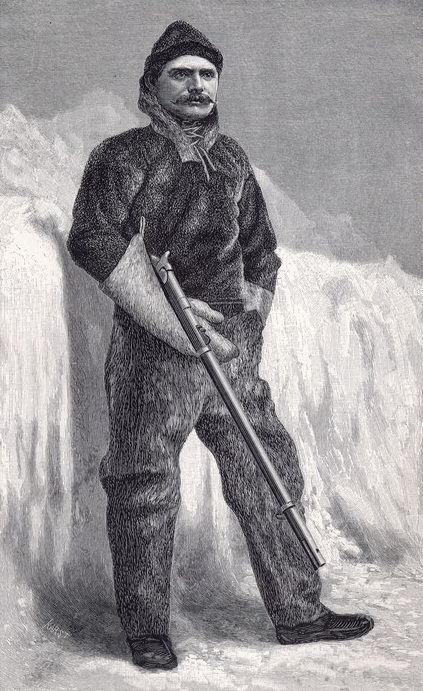 On this date in 1884, U.S. Army Private Charles B. Henry of the Lady Franklin Bay Expedition (LFBE) was summarily executed in the distant northern reaches* of present-day Nunavut. It’s waaaaaay up there. Click to view larger map, but don’t expect details. 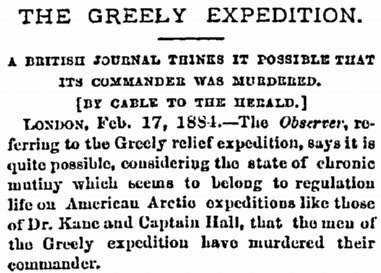 The “Greely expedition” — so called after its commander, Adolphus Greely — was dispatched from Washington in the enthusiasm of the First International Polar Year. This was a multinational collaborative to gather scientific data about the globe’s frigid polar reaches; technically, this first IPY spanned 1882 to 1883, but the ill-starred Greely mission set out in 1881. The LFBE was headed for a narrow icebound inlet named for a woman who lost her explorer husband on an Arctic voyage. That bay juts like a dead tree limb out of the Robeson Channel into the remote northern wildernesses of Ellesmere Island. The mission laid down for the 25 men of the Lady Franklin Bay Expedition in 1881 was to establish a weather station, and to collect astronomical and geomagnetic data. But long before the starving remnants of that crew put Private Henry to sudden death, they had supplanted that noble endeavor with the classic objective of polar adventure: mere survival. Matters started promisingly enough: the ship that ferried these men to their ordeal dropped them without incident at a natural harbor in Lady Franklin Bay, where the intrepid men built Fort Conger — a sturdy frame house 65′ x 21′ x 14′. They would spend the next two years making scientific measurements, exploring, and awaiting planned resupply ships in the summers. Ice-choked waters, however, do not open reliably to this location. The resupply missions in both 1882 and 1883 failed — and left the mission with a life-or-death choice. Per prearranged contingency, the supply ships, should they not be able to reach Camp Conger, were to drop their provisions at a backup location. Much against his men’s will, Greely gave up Camp Conger to chase this hypothetical cache. Camp Conger was more difficult for any future ships to reach but was secure, warm enough, and blessed with seal-hunting enough to keep the team in good health. Camp Sabine was reached only after a terrifying and near-fatal float down the coast in an ice floe (!) and it proved when they reached it a much less congenial spot for wilderness survival. The resupply missions that hadn’t reached Camp Conger had failed so thoroughly that only a very small drop had even made it to Camp Sabine. 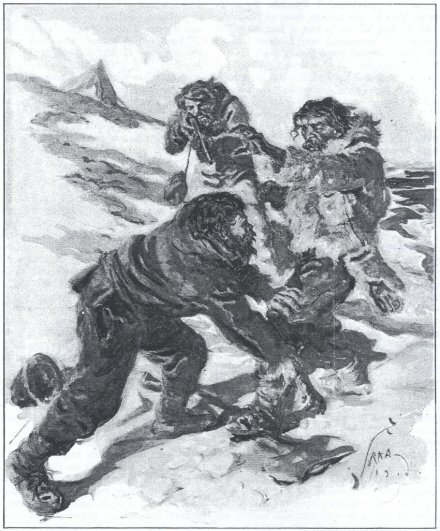 Conditions prevented the party from returning to Camp Conger or from crossing the water to another inhabited Arctic station: instead, they wintered in the mouth of hell; seal-hunting here was not favorable, and most days they were only able to supplement their dwindling cache of life-giving calories with a few shrimp and scraps of lichen peeled off the frozen rocks. Not only ravenous hunger afflicted the party, but scurvy too, and still worse a morale collapse among party members who regarded Lieutenant Greely’s leadership very lightly. Huddled in a makeshift stone hut, three years gone from hearth and home, bored and helpless and stretching out less-than-subsistence rations as far as possible and farther, nerves began to fray … and party members began to succumb to conditions. Charles Buck Henry did not wear well on this desperate party. “Henry” was actually the new alias of a German immigrant formerly known as Charles Henry Buck. Buck had served time for embezzling whiskey money from a frontier cavalry company, then escaped and slew a Chinese man in a Deadwood, S.D. brawl. Henry stole from the expedition’s small store of food: he was not the only one, but he was perhaps the baldest thief and the one with the fewest redeeming features that would balance this behavior. He’d been confined in March to his sleeping bag as the closest thing to punishment that Greely could visit on him. Still, Henry stole more. Resentful comrades ostracized him, while silently sizing up the discomfiting likelihood that the hulking German would be odds-on to kill any man among them in a fair scrap. This day, Greely finally caught him stealing once too often. Notwithstanding promises given by Pvt C.B. Henry yesterday [to stop stealing] he has since as acknowledged to me tampered with seal thongs if not other food … This pertinacity and audacity is the destruction of this party if not at once ended. Pvt Henry will be Shot today all care being taken to prevent his injuring any one as his physical strength is greater than that of any two men. Decide the manner of death by two ball and one blank cartridge. This order is imperative & absolutely necessary for any chance of life. That order Greely issued to his able assistant, Sgt. David L. Brainard. Brainard proceeded to gather two other men who contrived to “execute” Henry by a stratagem of approaching Henry armed, but casual, and distracting the unrestrained condemned man long enough to get the drop on him. They shot him dead just as Henry recognized his danger and started to lunge for a nearby axe — an incredibly chancy engagement that could easily have turned the whole expedition into a hyperboreal edition of “The Most Dangerous Game” had the mountainous Henry avoided or survived that gunshot. Instead, his body with its fatal bullet wound was discovered by accident when the Greely party was at long last rescued later that June, and returned along with just seven** (barely) living souls out of the 25 who set sail in 1881. Those fortunate survivors — the relief mission’s commander reported them “crying like children, hugging each other, frantic with joy”† as their rescue vessel pulled into view — would be forever defined by their participation in the LFBE: toasted for their survival story while also dogged by dark rumors of cannibalism. According to polar and maritime historian Glenn Stein, FRGS, who spent several years researching this jaw-dropping case,‡ they also closely husbanded the story of their one-time mate’s execution. Mr. Stein is also U.S. Liaison a present-day polar journey, the South 2014 Expedition, and he was gracious enough to speak with Executed Today about the LFBE’s execution. ET: The Lady Franklin Bay Expedition was a U.S. expedition launched as part of the first International Polar Year. Could you situate the LFBE in the context of polar expeditions at this time? GS: In the years following the 1875-76 British Arctic Expedition, it was suggested that nations should stop competing for geographical discoveries and instead dispatch a series of coordinated expeditions dedicated to scientific research. Eleven nations took part in the first International Polar Year (IPY) 1882-83, and the United States contributed two components to its first participation in an international scientific effort. In 1881, it was decided that the U.S. Army Signal Corps would establish one scientific station 500 miles from the North Pole, at Lady Franklin Bay, Grinnell Land. The other station was at Point Barrow, Alaska. 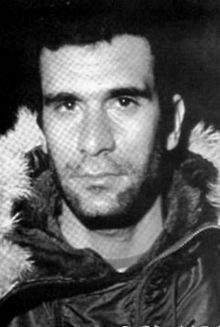 The executed man in this instance is Charles Henry, formerly known as Charles Buck. This man had a pretty disreputable history. How was he able to get on this expedition? – And, how did he become the Chicago Times correspondent for this journey? Did he actually file any stories? 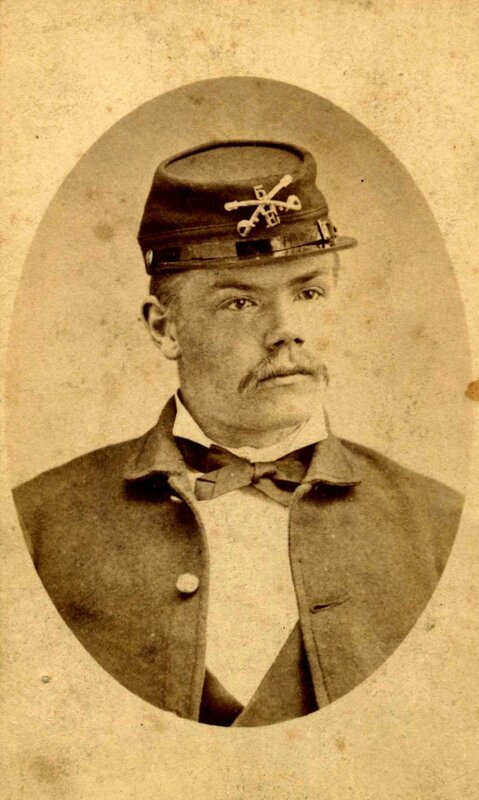 Buck enlisted in the Fifth Cavalry under the alias Charles B. Henry, and wrote to Lieutenant Greely from Fort Sidney, Nebraska, in April 1881, volunteering for the expedition. 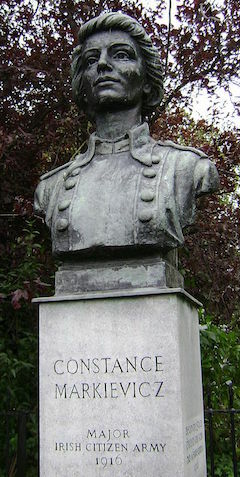 Henry had the strong recommendation of his company commander, Captain George T. Price, to back him up. Greely and Price were friends, so Greely leaned toward taking Henry (who repeatedly telegraphed Greely with reminders of his availability). Another story is that Henry joined from Fort Sidney when one of the original expedition members deserted just before it was to leave. However, as far as I’m aware, there was only one desertion from the LFBE, and that person was replaced by Private Roderick R. Schneider, First Artillery. Supposedly, since Henry was the only volunteer from the Fifth Cavalry, with a strong recommendation from post commander Lieutenant Colonel Compton, Greely decided to take him. This expedition lasted three years, 1881-1884, and it came to a considerable amount of grief. Could you sketch out what happened to the LFBE, and how it found itself in such a perilous situation in its last months? By the end of August 1881, a frame house was constructed at Lady Franklin Bay and named Fort Conger. Over the next two years scientific data was collected and sledging parties were sent out, discovering many new geographic features, and setting north, east, and west “farthest” records. Because of the mismanagement of resupply expeditions from the United States, expedition members initiated a planned retreat by boat to Cape Sabine in August 1883 — but the journey turned into a nightmare. The party eventually ended up at Cape Sabine, where the men constructed a stone house for the winter, with an upturned boat for a roof. It was christened Camp Clay. Throughout the following months, the men’s spirits and energy dwindled, and constant hunger was now their companion. Worse, food was being stolen from the commissary storehouse. More than once, angry accusations flew back and forth within the party. The daily ration for each type of food was measured out to hundredths of an ounce. 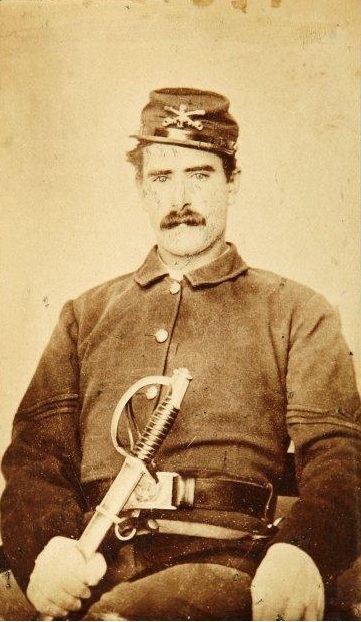 The first death occurred on Jan. 18, 1884, when Sergeant William H. Cross died of starvation. In spite of the privations, only one man died that winter, even though scurvy was also present. In the spring Death returned with a vengeance. So by the end, there’s a party near to starvation, just scraping by on a starvation diet. Naturally there’s a temptation for people to steal from the camp rations. Henry wasn’t the only person to have stolen, but it seems from your description like he was the most distinctly resented by the rest of the party. Why was that? During his time at Fort Conger, Henry was the originator of many profane remarks, misdeeds, and lies, so Greely and others had learned not to trust him. Until the publication of my article, “An Arctic Execution,” LFBE historians consistently wrote that no one on the expedition knew of Henry’s criminal history as a forger, thief and accused murderer. However, I discovered within Sergeant Brainard’s unpublished daily notes that he definitely knew of Henry’s past — so who else knew as well? In consequence, although others also stole food, Henry would have been treated with less tolerance. The specific details of the execution, and the variations on the story that are given later, are quite fascinating. The execution was ordered by the camp commander, but Henry was not confined and had no idea what was coming, because the shooting party could have been in some danger as well. Given the rough and ready circumstances, why then, does the execution party go to such elaborate ends to anonymize the shooter? There’s the “three guns, two balls” order, and then they can’t comply with that since there’s only one usable rifle, so they swear an oath among themselves never to tell. Firing squad duty obviously preys upon the conscious and subconscious mind. 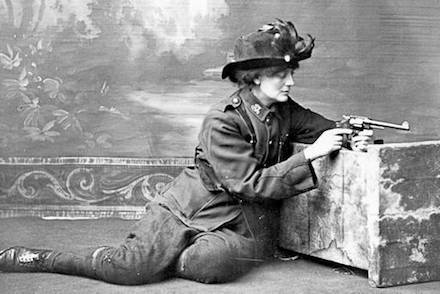 It’s possible that passing the rifle around and swearing an oath replaced the anonymity provided by the “three guns, two balls” order. Keep in mind that, if the three men survived their Arctic ordeal, their participation could impact them for the rest of their lives — in and out of the Army. 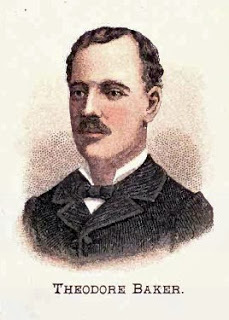 As a factual matter, it was either Brainard or Francis Long who pulled the trigger, since Frederick distracted Henry and lured Henry into the trap. Charles Henry (left), and his two potential executioners: David Brainard (center) and Francis Long (right). And you think Brainard carefully managed the way the dangerous execution story got out. Brainard is like a historian’s dream. Not only was he there, not only was he a very intelligent individual — but he made a record of many things, keeping daily notes that go from start to finish. I hand-copied each page, three years of field notes, and I referenced these in my article. Those notes represent his impressions at the time they were written, not edited versions. One crucial thing Brainard recorded about Henry was that he “is a born thief as his 7th Cavalry name will show — a perfect fiend.” That’s significant, because it doesn’t appear in Brainard’s published writings. Why omit that piece of information? There’s one reason: Brainard knew beforehand that Henry was a criminal, and if it was known Brainard possessed this information, then he may appear prejudicial regarding the decision to shoot Henry. It starts to add up, because who had control of the expedition members’ journals on the passage home? Brainard. Who wrote up an incomplete journal on the way home — and then, many months later, turned in writings covering several more months — but ending in March 1884? Brainard. I’ve examined the three volumes of his original journal. Everything was very carefully written, and Brainard made sure the story he wanted told got into these journals. Sgt. Brainard had been promised a commission by Greely for his leadership on the LFBE. That’s a huge deal — to get commissioned from the ranks for gallant and meritorious service, and not even in wartime, but peacetime. At that time, and for many years thereafter, he was the only living officer of the Army, active or retired, holding a commission awarded for specific distinguished services. I believe Brainard was a “good guy” and a stand-up guy, but at the same time, would he really chance ruining his opportunity to get that commission? The whole execution business could have made things really difficult for him. When they evacuated Fort Conger, and later on were literally floating south on a piece of ice, there was almost a mutiny. The mutineers went to Brainard, saying Greely had to be relieved of command, that he was going to get everyone killed. But Brainard wouldn’t go along with it — in part, he probably realized it would destroy his future. You have to start looking at these motivations; and it’s not an entirely unsympathetic view, because people in these positions had jobs to do. It took a lot of pushing to get Brainard’s commission to Second Lieutenant approved, and this didn’t happen until October 1886. In 1917, when he was near the end of his career, he was actually appointed Brigadier General. Brainard went from buck private to Brigadier General! After the LFBE’s rescue later in 1884, how was the matter of the execution handled? I’m reading between the lines here, but it seems to me that, while it was not a secret, it was also downplayed as a public matter in the immediate aftermath — Henry buried with full military honors, that sort of thing. As it emerged more publicly thereafter, was there ever any controversy or a significant sentiment that Greely had handled the situation improperly? Was there ever a question about the legality of his order? It was understood that any military officer operating in the field possesses a fair degree of discretion in carrying out orders, and Greely had Henry executed in order to preserve lives. Newspaper articles certainly featured Henry’s execution, but stories of cannibalism (including the condition of Henry’s remains) and the political scandal related to the mishandling of the attempted relief of Greely prior to his rescue were much more high profile stories. You have a professional interest in polar exploration, and obviously starvation risks are endemic to these situations when matters go awry. Have you encountered any similar instances of a polar party executing one of its members for the sake of maintaining discipline? A somewhat similar execution scenario, also an attempt to preserve the lives of starving men, had played out during Sir John Franklin’s 1819-22 Arctic Land Expedition. A detachment of four men from the expedition, including Surgeon John Richardson, discovered that their comrade, Midshipman Robert Hood, had been murdered by an Iroquois voyageur named Michel Teroahauté (also known as Ferohaite). Under the circumstances, Richardson shot Michel to save their own lives. How did you come to find out about this story and why did you decide to research it in such depth? Over a century on from the events themselves, what does the fate of Charles Henry have to tell us today? I can trace back my knowledge of the execution to at least September 1988, when I bought a copy of The Polar Passion, by Farley Mowat (1967). Several years later, I acquired a large collection of items once belonging to General Brainard, which included most of his medals and orders, photographs, books, and a bone knife he brought back from the Arctic. Brainard is a fascinating historical figure and human being (I like to call him the quintessential American), and I spent a good deal of time researching and writing about his life. 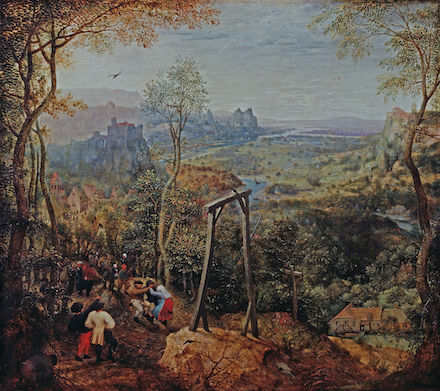 In the process I discovered there were many contradictory details about the execution. On July 13, 2005, I was sitting at an outside bar in Jamaica, when it dawned on me that if I dug deep enough, I just might be able to figure out what really happened during the execution of Private Henry. So, I began jotting down notes on three 4″ x 5″ pieces of paper — “1. Primary Question: Who was the shooter?” Of the three men involved, the evidence dictates the trigger man must have been either Brainard or Long — but in the absence of conclusive evidence we’ll probably never know which one. And I ultimately decided that’s okay, because it’s the way the three wretched souls wanted it to be on that fateful summer day in 1884, and I needed to respect their wishes. The events during the Lady Franklin Bay Expedition, especially Charles Henry’s fate, are reminders of how crises bring out the best — and worst — in human nature. At various times in our lives we’re all confronted with personal crises: how we deal with them is what counts. Writing “An Arctic Execution” forced me to stretch my mind beyond what I thought were its limits to attempt to understand defining moments in the lives of human beings who were at the brink of oblivion. * This expedition established a “farthest north” record: it was for the next several years the most northerly latitude that any explorer could document ever attaining. ** One of the seven retrieved by the Thetis, Sgt. Joseph Elison, was at death’s door. Wasted to 78 pounds and stricken with frostbite and gangrene that required his rescuers to amputate both hands and both legs, Elison died at sea — leaving just six survivors of the Lady Franklin Bay Expedition who would ever again set foot on American soil. † San Francisco Bulletin, July 18, 1884, quoting Winfield Scott Schley — later famous as a Spanish-American War hero. ‡ Glenn M. Stein, “An Arctic Execution: Private Charles B. Henry of the United States Lady Franklin Bay Expedition 1881-84,” Arctic, Vol. 64, No. 4 (December 2011). Read it here (pdf). The last person hanged in Wales was Vivian Teed on this date in 1958; he was also the first hanged (in Wales or anywhere) under the new Homicide Act of 1957. Teed went to rob a Fforestfach post office and was surprised to find 73-year-old postmaster William Williams not only present but in a mood to resist him. The thief had brought along a hammer in case he needed to force a door or something, so he grabbed it and hammered Mr. Williams … over and over and over. Twenty-seven times. Then he rifled the station as planned while the mortally wounded old man moaned and twisted, unable to come to his feet because the floor was so slick with his own blood. After many decades when hanging was the mandatory sentence for the crime of murder (even though in practice not every murder resulted in an execution), public consternation at certain sensitive cases like those of Ruth Ellis and Derek Bentley had driven a legal reform whose intended upshot was confining the death sentence to the proverbial worst of the worst. 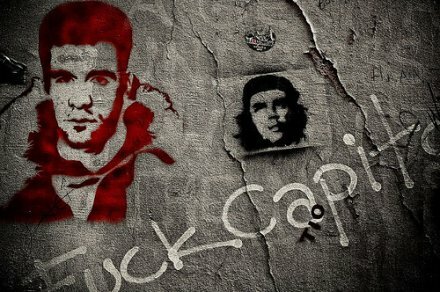 The Homicide Act created a new subcategory “capital murder” — especially heinous murders, such as killing a policeman or committing murder in the course of a theft. Vivian Teed went to the gallows under the latter statute. But the Homicide Act also removed certain types of homicide from the murder category altogether — notably for Teed’s purposes, a new defense of “diminished responsibility” was explicitly authorized and defined. This defense would have saved the mentally impaired Bentley. Now Teed tried to claim that an “abnormality of the mind which impaired his mental responsibility” was what really hammered William Williams’s skull. Only one holdout member of the jury bought this, but after a number of hours and a couple of separate attempts by the panel to declare itself deadlocked, she or he finally came around and voted to convict. 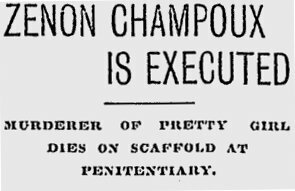 Teed hanged at Swansea Prison seven weeks later.